Kentin Jivek is experienced in several genres, including (dark) ambient and psychedelic folk. He's also a gifted vocalist with a distinct clear voice. Arsenal is mainly a collection of songs, except for 'Dead Is Not Dying' which is a six minutes lasting ambient piece that somehow reminds me of Tangerine Dream and 'Hypnosis II', a mainly instrumental piece where the voice is used solely as an instrument. 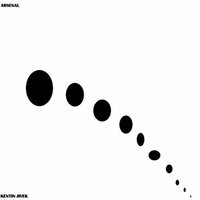 With a range of instruments, electronics and soundscapes Kentin Jivek succeeds in creating a very atmospheric album that is capable of keeping the listener focused. The strong, compelling voice gives the whole a 'folk noir' feel that is perfectly suited for a morning like this. Although my French is not good enough to really get into the stories, I'm quickly sucked into this dreamy mood. The songs, apart from the instrumentals, somehow all sound a little alike but it never gets monotonous or boring. A lesser experienced musician would probably experience problems keeping his listeners entertained but it seems that Kentin Jivek knows a little something about build-up, layers, songwriting and experimentation. This is some decent quality music, trying to find a niche between Klaus Schulze, Dead Can Dance and Jacques Brel. So yes, Arsenal is a good album that could possibly use one or two extra instrumental tracks to make it complete. It is indeed the soundtrack that I was looking for on this bleak morning. It's a well-played an well-written epos that makes this cold day a little warmer and a lot more enjoyable. It's available as a digital download on his bandcamp-page. I have no information about this album being released on CD, tape or vinyl but as far as I'm concerned, this is definately something to pick-up or to download. Great work.